Truthfully there is no such thing as a Brown Ebony. All ebonies by definition have no tone making them black, white, or some shade of grey. Brown Ebony is native to the drier regions of South America. Brown ebony takes on a glass like polish when finished and has a rich brown tone with dark patterning through the grain. Can I get a quote and availability of this wood for D6 and D10? 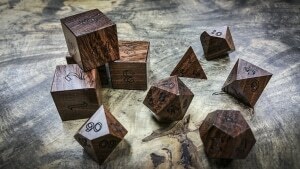 can you put up a picture of this as finished dice? can we see a pic of a finished set?